First of all ... what is up with Blogger? I can't add pictures and I can't hit "enter" to go to the next line to type. And ... I actually have SOMETHING to post today. That means if I post it will come across as one big old paragraph. I give up ... I'll try again tomorrow. First of all ... Blogger is doing something funky and will not let me go in and edit the html of my posts. That's the way I've always managed to get my pictures and wording where I wanted them. So, I'm not really sure how this is going to look. First you will probably see pictures and then wording. This past week Mike's Dad Ray and Step Mom Jeri came for a visit. It was a great visit. Jeri is SO good with Griffin ... she spent lots of outdoor time with him. We went to the zoo on Monday. Then on Tuesday and Wednesday Ray helped Mike finish the siding on the addition. They had to rent lift and it was nice to have Ray here to help Mike. Thursday Jeri, Griffin and I went shopping. And then on Friday ... we drove to Baltimore. It's only 2.5 hours from our house. I had no idea it was so close. We arrived and we were greeted to a beautiful downtown on the inner harbor. It's so gorgeous ... and let me tell you ... WEIRD! That's actually the slogan for downtown "It's Weird Down Here". There were so many people dressed in what I would call costumes. But I think they must dress that way all the time. We had a wonderful lunch at Phillip's Seafood right on the water. 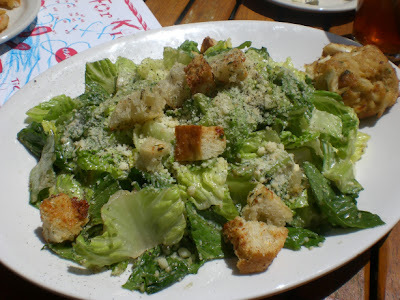 The picture of the Caesar Salad and Chesapeake Crab Cake is my wonderful lunch. It was delicious! It's my first crab cake ... ever! It was so, so good!! 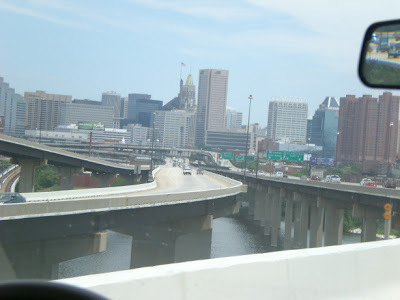 The first picture is of the city as we were driving in. 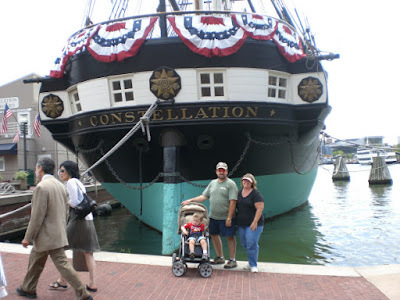 The 2nd picture is Mike, Griffin and me in from of the Constellation. Gorgeous Boat! 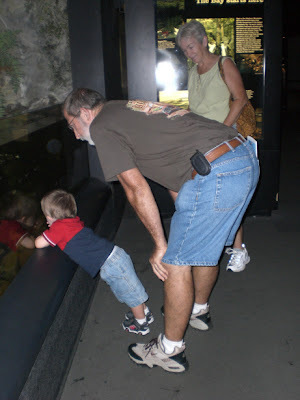 The 4th picture is Ray, Jeri and Griffin at the Baltimore Aquarium. That was our original destination. Let me just say this ... NO STROLLERS. Uggghhh!!! It was horrible!! Griffin wanted to be everywhere but where we wanted him to be. They wouldn't allow us to carry him on our shoulders and he was too big for the backpacks you could rent. Let's put it this way ... it was NOT the most fun part of the trip. We left the Aquarium after just a short time and ended up at Discovery Zone. It's like an indoor playground for children. Griffin LOVED this. 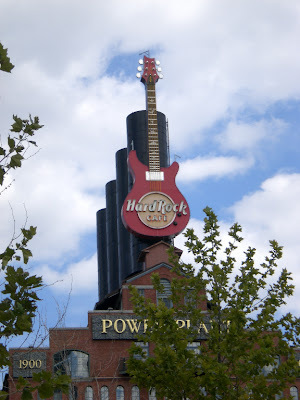 The last picture is of the Hard Rock Cafe ... I just liked the way this picture looked and thought I would share. I asked a couple of people if they knew where Charm City Cakes was ... those of you that watch The Food Network know it's Duff Goldman's Bakery (Ace of Cakes). No one seem to know what I was talking about. 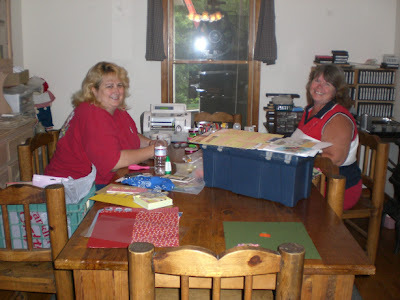 This is a picture of Julie and me scrapbooking together in my messy dining room ... now you can see where I work! Have you ever had a "really good friend" that you've never actually met? I met Julie, the person I call my "really good friend" online 9 years ago. She started as a customer of mine on Jangle.com Scrapbooking Auction Site. And through the years our friendship has grown and blossomed into something I value alot. In addition to being a great friend, she's still a really good customer too ... something I feel really funny about sometimes. Well ... after 9 very long years ... we finally met in person!! She's recently started driving a semi truck and her schedule allowed her to come and visit us for a few days. I'll be very honest ... I was VERY, VERY, VERY nervous. We've chatted on the computer, talked on the telephone alot, exchanged pictures ... etc ... but this was REAL LIFE. And you know what? She's exactly the way I've imagined her to be all of these years. We've had alot of fun shopping, chatting and we actually did some scrapbooking together. Griffin took right to Julie ... it's so cute ... he loves her so much ... and so do we!!! Thanks for coming to see us Julie! 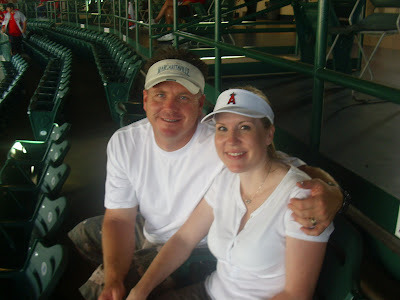 I hope you don't mind I borrowed this picture of you and your sweet husband from your blog! We wish you the HAPPIEST birthday ever!! I am still here ... wow ... life has been so busy lately. I just haven't had a chance to blog. I've never had a busier summer ... I guess having a 2 year old will do that to you. We will have family visiting for the next two weeks. I love having people visit us ... it feels so nice having people around. I haven't had a chance to visit anyone's blog either ... I hope to get caught up soon! Don't give up on me. I will blog soon ... I have soooooo many cute pictures to share when I have a chance to get them loaded. It's another cool day outside for us here in Virginia today. Griffin and I will be meeting our friends Heidi, Ryan and Evan at the Metro Richmond Zoo today. A few months ago we bought an annual pass ... and it was worth the money we spent on it. We looking forward to seeing our buddies today. 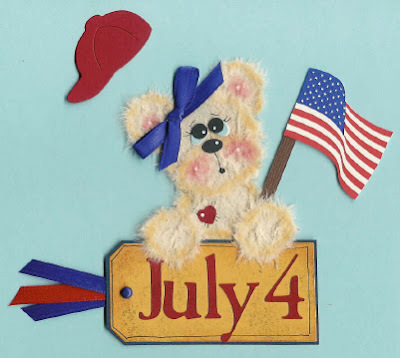 I designed the "July 4" tag above the other day. I will be listing two of these in my Ebay Store later today. Gosh ... I am having SO much fun creating some new things lately. I have SO many ideas ... but not alot of time. Griffin and I wanted to go swimming at the YMCA this morning. It is 61 degrees outside at 9:00 am ... can you believe that? It CAN'T be 61 degrees outside. Think there's any chance it will warm up enough to go swimming by 10:30?